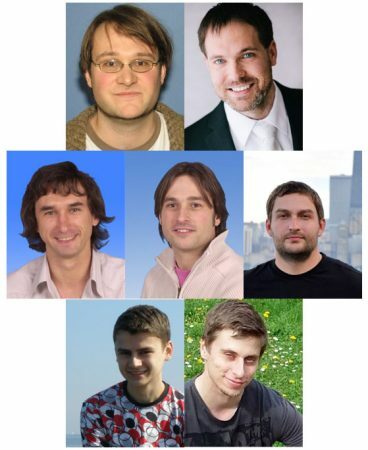 From top left to bottom right: Andreas Jung (Fermilab, now at Purdue University), Jiri Franc (Czech Technical University, Prague, Czech Republic), Slava Shary and Frederic Deloit (CEA Irfu SPP, Saclay, France), Yegor Aushev and Mykola Savitskyi (Taras Shevchenko National University, Kiev, Ukraine) and Michal Stepanek (Czech Technical University, Prague, Czech Republic) are the primary analysts for this measurement. This is the Feynman diagram for a quark-antiquark pair on the left combining to form a gluon (marked g), which breaks into a top and antitop that decay on the right. As described in the text, it is possible from the diagram to calculate the rate at which this type of event occurs. 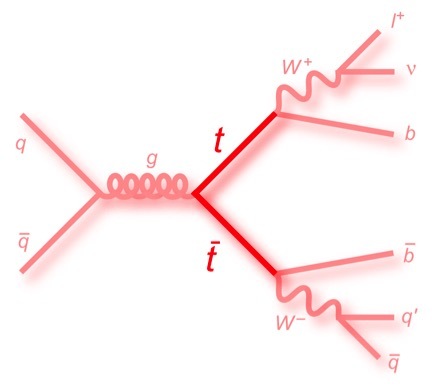 The figure [above], called a Feynman diagram, shows a quark and an antiquark on the left merging to form a gluon; then the gluon turns into a top quark and a top antiquark, each of which decays into some other particles on the right. In a very simple and intuitive way, this depicts a certain type of event that was measured in the Tevatron. But the diagram also is a symbol for a number. You see, this whole process is quantum mechanical; one can only give a probability for that type of event to happen. The really nifty thing about the diagram is that it is a shorthand code for how to compute that probability. From the diagram, using a table for decoding it, you can write down the mathematical expression that gives you the probability. In this particular case, for the gluon you write down igαβ/ (p2 + ie) or some such thing; I won’t go into the definitions of g and p and such, but the point is that this is in the end some specific number. And you will multiply this by some other numbers for the initial quarks and for the antiquark, and for the top quark and so on. The resulting product will tell you how frequently this type of event occurs. Unfortunately, subatomic particle physics isn’t that simple. Top quarks, or indeed, any quarks, exist only in a sea of other particles that wink in and out of existence. They aren’t part of the top quark, but they can’t be separated from it, either. Should they be counted as contributing to the mass of the top? The mass that is usually measured in collider experiments is different still, since it comes from measuring what the top quark decays into. It’s called the MC mass, and it isn’t necessarily the same as what we want for the number that goes with the diagram. After all, the number that goes with the diagram (called the pole mass) is involved in how often the event occurs, not what comes out of it. So there is this long-standing theoretical question: How does the MC mass relate to, say, the pole mass? Y’know, clearly they are related, but how, exactly? Here comes the trick: Measure the pole mass directly. We can do this by measuring how often the event occurs and knowing all the other numbers that you read off the diagram. Then you know the number for the top quark and therefore you know the pole mass. The result isn’t as precise as measuring what the top quark decays into and figuring the MC mass, but at least you know the number that goes with the diagram. Recently, DZero measured the rate at which top-antitop pairs were created in the Tevatron; specifically, we measured the production cross section with a refined strategy to improve the accuracy of the measurement. The result is picobarns. From that, we then went and obtained the pole mass of the top quark. The result, GeV, is the most precise determination of the top quark’s pole mass at the Tevatron. Despite the lower precision than the MC mass taken from the decay products, it is a more powerful measure of the top quark’s role in the world.